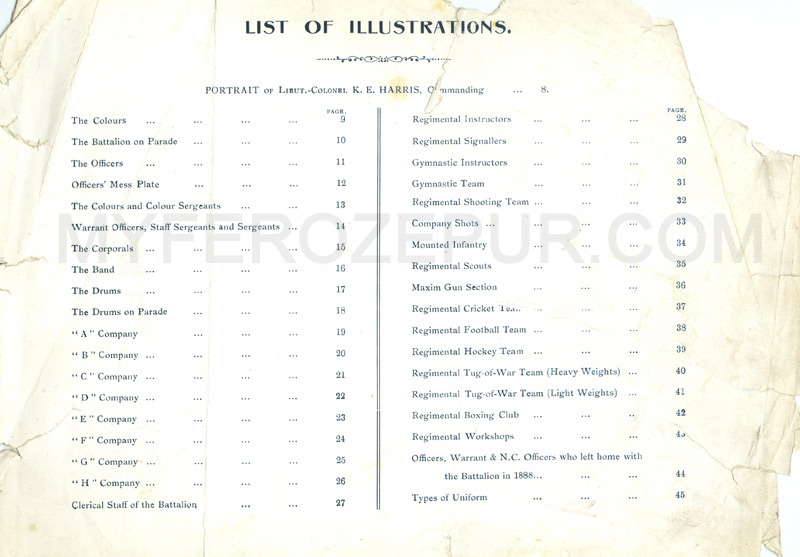 1st Bn The Dorsetshire Regiment - A List of Personnel, 1905. 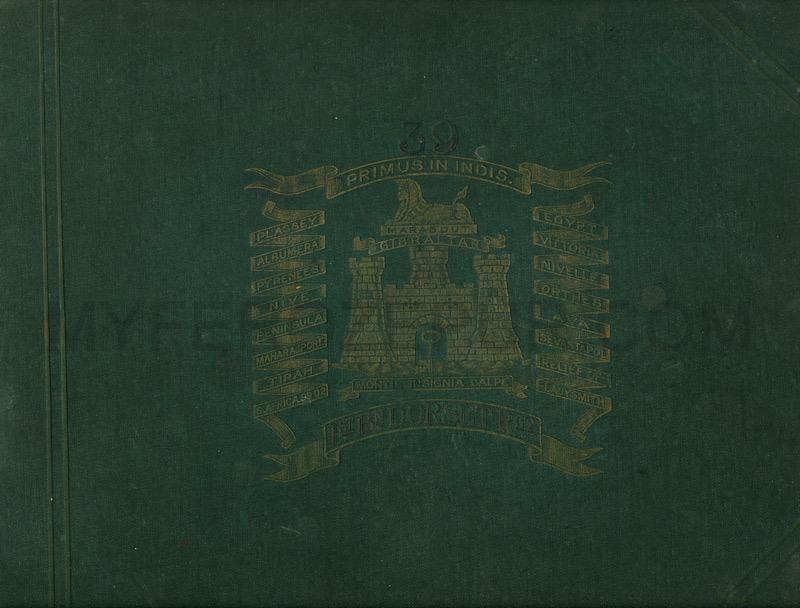 & The 54th (West Norfolk)Regiment of Foot, The 39th formng the 1st Battalion of the new regiment. 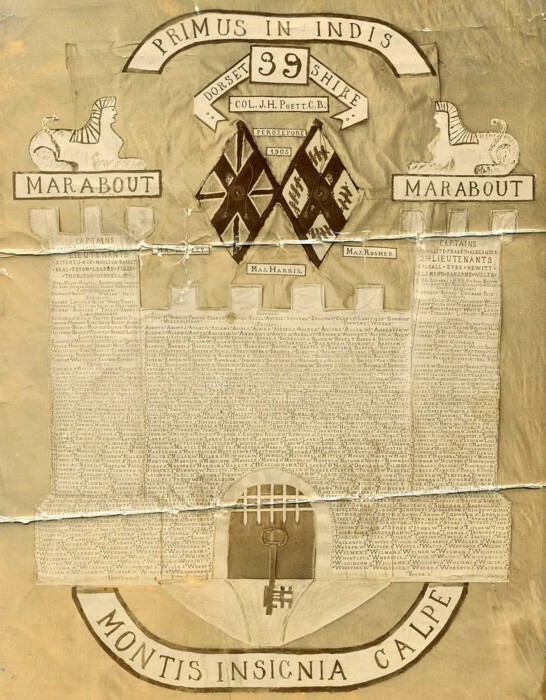 The original cap badge of The Dorsetshire Regiment featured a two-turret castle over a sphinx within a laurel wreath, with name scroll "DORSETSHIRE" at the top. 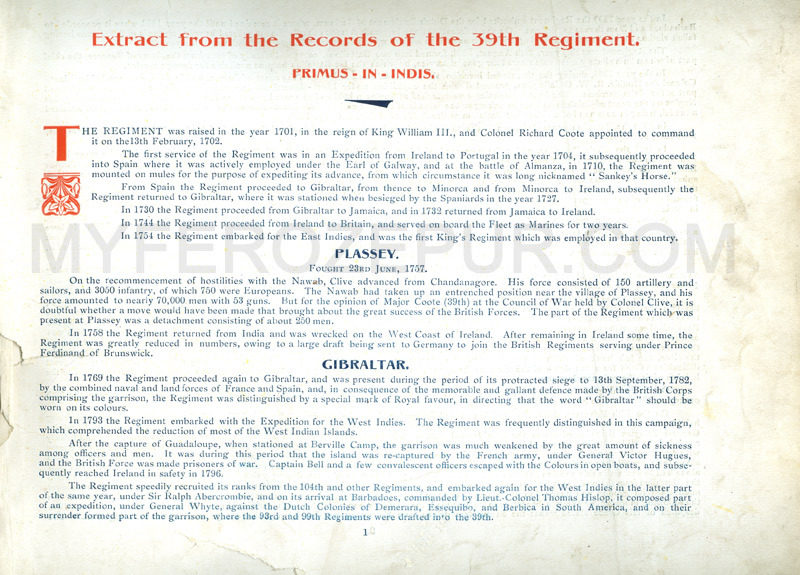 Following standardisation of the design of Gibralter Castle as represented on the cap badges of a number of regiments, the Dorsetshire’s badge was altered so that the sphinx was above the castle, which now had three turrets, & the name scroll was at the bottom of the wreath (sealed 18/10/01). In an article "Headdress Badges of The Dorsetshire Regiment" which appeared in the Crown Imperial journal during the 1980's / early 90's Colin G. Churchill states that the two turret badge was worn from about 1894 until about 1906, & that the Other Ranks version of the three turret badge was adopted some years after the officer’s & NCO’s versions were introduced into wear, being worn on the Broderick cap from 1903. The H.Q. of the Regt. is in Dorchester and the entrance to the barracks is built in similar shape to your illustration - for some reason I had never connected the shape with Gibralter. They are a much loved Regiment and of course, have the Freedom of Dorchester. Thankyou. Title changed to The Dorset Regiment in 1951, amalgamated with the Devonshire regiment on 17/5/58 to form The Devonshire and Dorset Regiment, (part of The Wessex Brigade & wearing the brigade cap badge 1958 - 1968),now part of "The Rifles" I believe Merv. I put a thread on Dorset Regt badges together a couple of years ago, I'll dig it out & post it on a seperate thread on the regiment, if somebody wants to start the thread off in the meantime, I'll catch up on it. 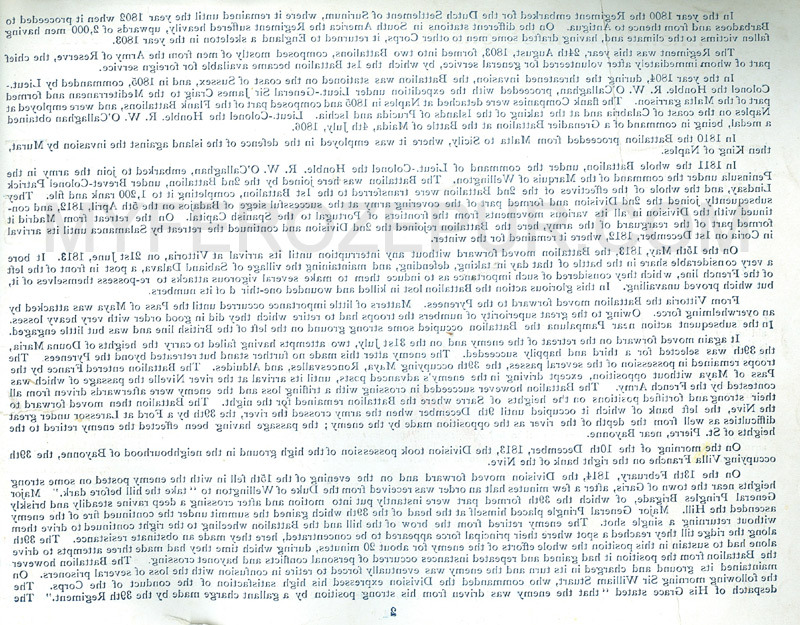 If you look closely between the Colours you'll see that the list was complied at Ferozepore, India in 1905 and not 1903. Hopefully the Battalion Nominal Roll still survives and all of these lads could be given relevant regimental numbers. 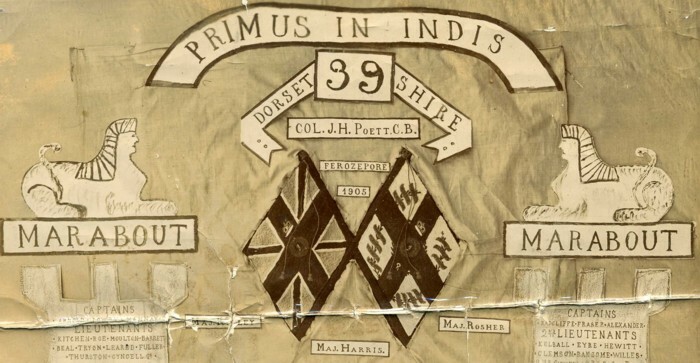 Also under the terms of enlistment for the infantry of 12yrs(7yrs with the Colours & 5yrs with the Reserve), a good few may have seen service during the Great War. This A 4 sized photo came with a cabinet photo of a Dorset, I think with Vctorian Crown helmet plate, & with a pair of old green Drummer's cords. Wonder if he was one of the drummers on the list at the top?? It's an amazing piece of military history and a worthwhile future project to determine the fate of all those listed. 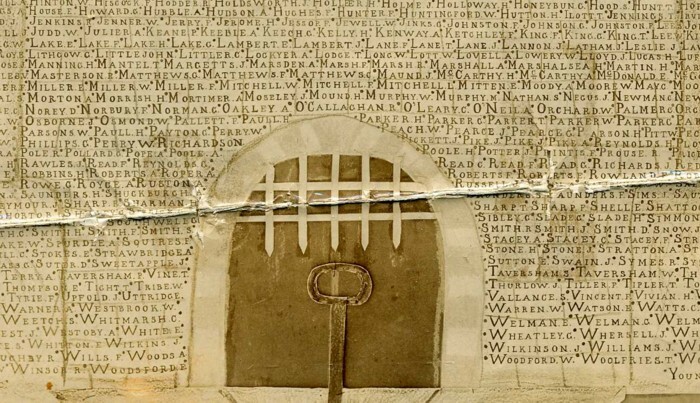 Leigh - I was looking at the names on the cut-out - and believe it or not, my name is under 'M' - spelt MITTEN. They were the Midlands branch of the family and spell with an E not an O. Fantastic - if anyone can add to this it would be quite exciting. Yes, I saw that there was a "Mitten" there as I was posting - there's also a Kitchen, think, a Lt - I have'nt checked the photo for years. Leigh, what a superb find, worthy of a museum. 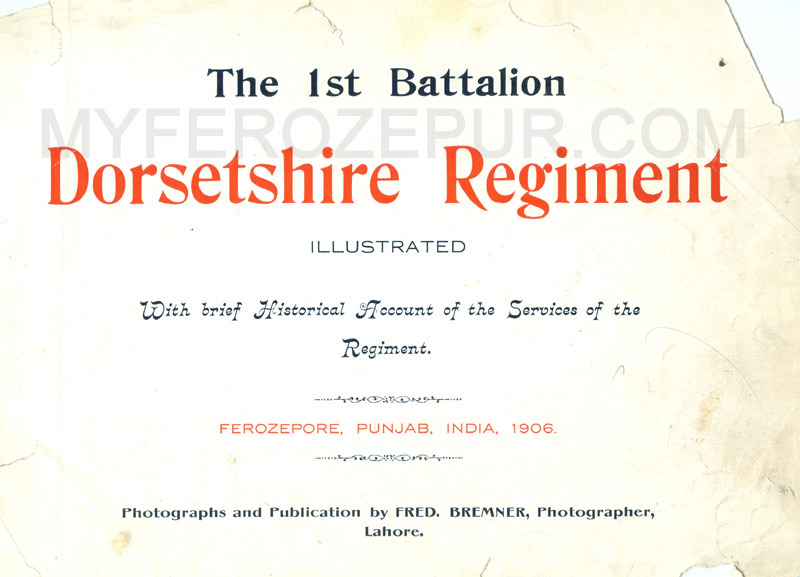 Following Narinder Sethi's post to his website I had a look at his album of the 1st Dorsets. Many of the names on your piece are pictured in the album. The album is a superb reference to the uniforms and badges of the time and the photography very good considering the date. In my search for confirmation of wear of the '1906 wide wreath Dorsetshire cap badge' I thought I had the enigma cracked with the photo on page 24. The Sgt. 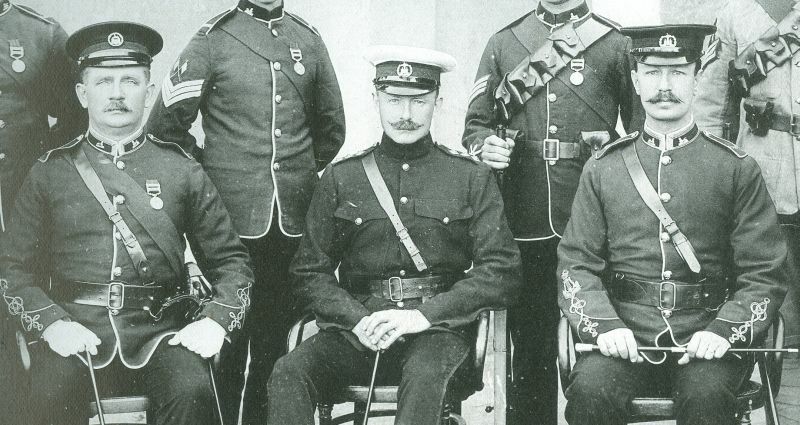 Major is wearing the pre 1901 two tower badge, the Adj sitting beside him has the badge worn up to amalgamation and the Bandmaster looked to be wearing the wide wreath. I emailed Narinder who graciously sent me a lovely enlarged scan of the photo. Alas it turns out that the Bandmaster is indeed wearing the normal badge. Close, much closer but no cigar yet. Of course every avenue of search has it's side streets and ths one is no exception. 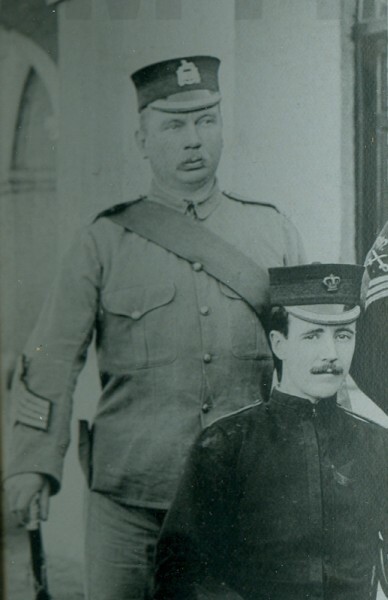 On the left of this photo captioned 'Regimental Instructors' is Sergt.-Dr. Clarke. It's interesting to see he is wearing what I always thought was the Officer's forage cap badge from the 1890s. He's the only one bar a Sergeant in the band wearing one. He's shown with 'The Drums' and must be what we'd now call a Drum Major. What would his title have been then. Sergeant of Drums? Also why is his uniform so different? The album can be found here. The rest of the site is well worth a look as is searching for Fred Bremner the photographer. Just for info here's the trio that sparked my interest. Left to right:- Sergt.-Major Hunter, Capt. & Adj A. L. Moulton-Barrett and Bandmaster R. J. Shepherd. I must find myself a copy of this album but where ? Hello Jim, nice to see you around, I sent Narinder scans of the photos he asked for & asked him to post his album here, as yet he has'nt, so I'll post the photos. Thanks Leigh, doing a Google search throws up references for Sergeant of Drums, Drum Sergeant etc. No real good explanations though. 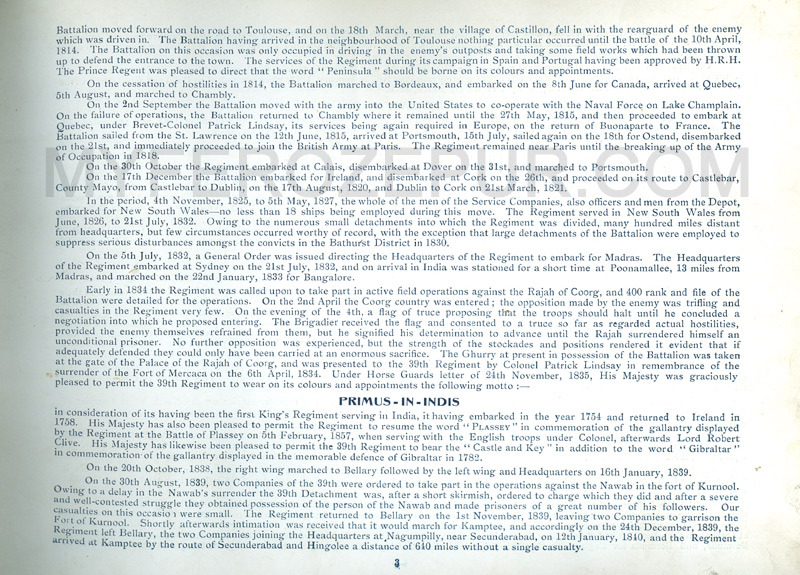 Seems regardless of rank he carried the appointment of Drum Major and was thus referred to.